When you visit our area this summer, you may hear adventure calling from the Lehigh River. 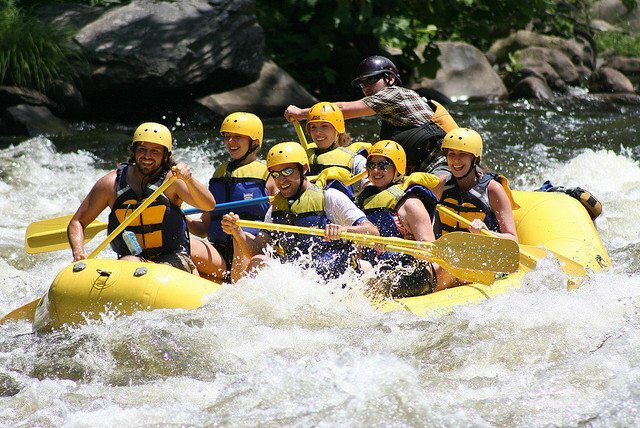 When you do, get your adrenaline pumping by spending a day on a Lehigh River rafting excursion. Whitewater rafting trips are a great day trip away from Bethlehem, PA and you’ll find several excellent Lehigh River rafting companies less than an hour from our bed and breakfast. The Lehigh River is a 109-mile-long tributary of the Delaware River. It flows through the Pocono Mountains with a winding course that makes it ideal for recreational rafting. Take a look at some of these Lehigh River rafting excursions and find the one that is best for you! Going on a Lehigh River rafting adventure is just one great thing to do in our area. Find our best recommendations for restaurants, attractions, historic sites, and more by requesting a copy of our FREE Vacation Guide today! This Lehigh River rafting company offers three different trips to accommodate guests of varying abilities. At Jim Thorpe River Adventures, the Easy Whitewater Rafting trip is an 8-mile trip that offers guests 3 hours on the river. The Introduction to Whitewater Rafting Trip affords you 4 hours of rafting and is a bit more challenging than the Easy trip. The BigTime Whitewater Rafting Trip is the ultimate Lehigh River rafting experience with more than 20 rapids. The 5-hour trip covers almost 13 miles of the river. Pocono Whitewater in Jim Thorpe, PA, is another great choice for Lehigh River rafting. They offer two types of trips: the Family Style Whitewater and the Lehigh Gorge Dam Release Whitewater. The Dam Release is the more challenging and longer of the two. It features Class III rapids and lasts 5 hours. The Family Style Rafting trip is a bit easier and shorter, with mostly Class I and II rapids. There are also special rafting trips such as a Moonlight trip at night, a Pocono Pirate Rafting excursion, and a combo adventure that also includes biking and paintball! Whitewater Challengers is a Lehigh River rafting company that offers a variety of Dam Release and Natural Flow Whitewater Trips. The Dam Release trips occur on special dates throughout the summer and offer better rapids and deeper water than the typical day on the water. Trips range from easy, short courses to “marathon” trips that can span up to 25 miles. Whitewater Challengers also offers inflatable kayak trips and more! The Lehigh River rafting season at Whitewater Rafting Adventures in Nesquehoning, PA, begins in March. This great choice offers several rafting trips to choose from including regular Whitewater excursions, E-Z Whitewater trips, and special Summer Rafting adventures. The most popular choice is the standard Whitewater trip. It lasts around 5 hours and covers 13 miles of the Lehigh River. The trip includes 18 Class II and Class III rapids. But, if you’re looking for a great intro to Lehigh River rafting with Class I and II rapids, take the 8-mile, 4-hour E-Z Whitewater trip. Or if you just want to spend the day on the river without the whitewater experience, Summer Rafting trips are the perfect option. Relax at the Sayre Mansion After Your Lehigh River Rafting Adventure! After a long day in the sun, tackling the Lehigh River rapids, return to the Sayre Mansion to relax and recover at our luxurious bed and breakfast. After a full day of adventure, you’ll find our elegant guest rooms to be the perfect retreat. Our meticulously restored mansion has the charm of the past mixed with modern conveniences and luxuries that make our Bethlehem bed and breakfast the ideal home away from home. Of course, your stay includes our Innkeeper’s breakfast each morning, the perfect fuel for taking whitewater, or simply enjoying downtown Bethlehem. The Sayre Mansion is the ideal place to make your visit to the Lehigh Valley into the ultimate getaway. Learn more about us and book your stay today! We look forward to seeing you soon!